Over the last year or so Looney Labs has been developing their line of educational based Fluxx games. 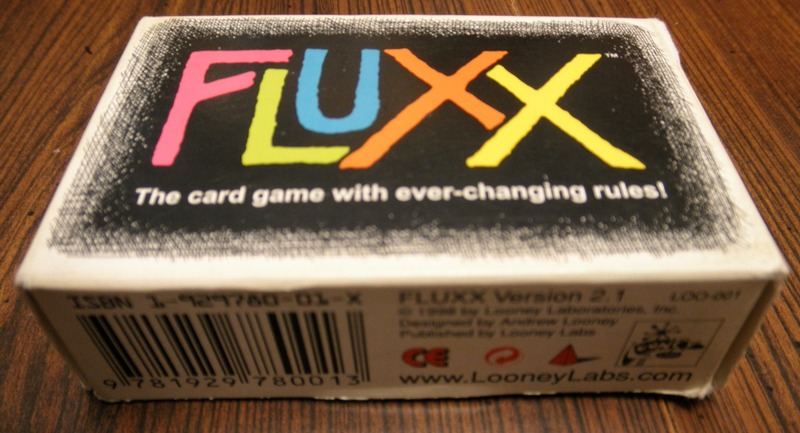 The first two games in the series were Math Fluxx and Chemistry Fluxx which I looked at in the past. 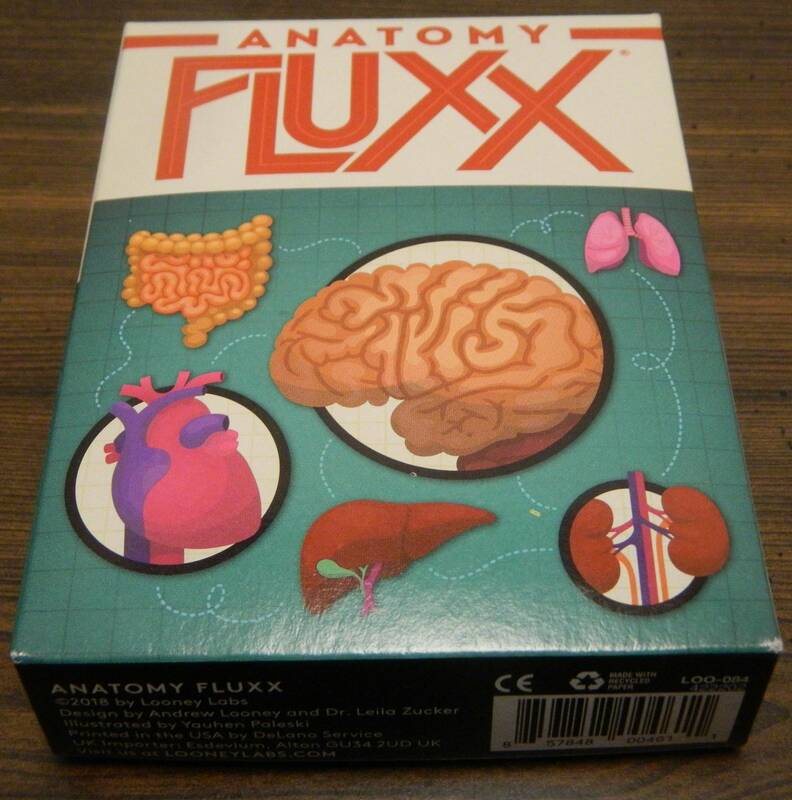 Today I am looking at the third game in the educational line of Fluxx games, Anatomy Fluxx. Being more of a math nerd in school, I have to say that biology/anatomy was one of my least favorite sciences. As Math and Chemistry Fluxx added some interesting educational mechanics to Fluxx, I was intrigued to see what Anatomy Fluxx would add to the series. Anatomy Fluxx doesn’t drastically change the Fluxx formula but it does a good job adding a biology/anatomy educational mechanic to Fluxx. We would like to thank Looney Labs for the review copy of Anatomy Fluxx used for this review. Other than receiving the review copy we at Geeky Hobbies received no other compensation. Receiving the review copy had no impact on the content of this review or the final score. Remove the Basic Rules, Meta Rule, and Name That Organ cards from the rest of the cards. The players decide whether they are going to use the Meta Rule card. Shuffle the rest of the cards and deal three cards to each player. The rest of the cards form the draw pile. Whichever player decides to draw a card from the draw pile first starts the game. Draw cards from the draw pile equal to the current draw rule. At the beginning of the game players will draw one card. Play cards from your hand equal to the current play rule. At the beginning of the game players will play one card. Discard cards from your hand to get down to the hand limit. At the beginning of the game there is no hand limit. Discard keepers if you currently have more keepers in front of you than the keeper limit. At the beginning of the game there is no keeper limit. Throughout the game players will play rule cards which can change how many cards players draw, how many cards they play, and whether there is a hand or keeper limit. There are four rule cards currently in play. 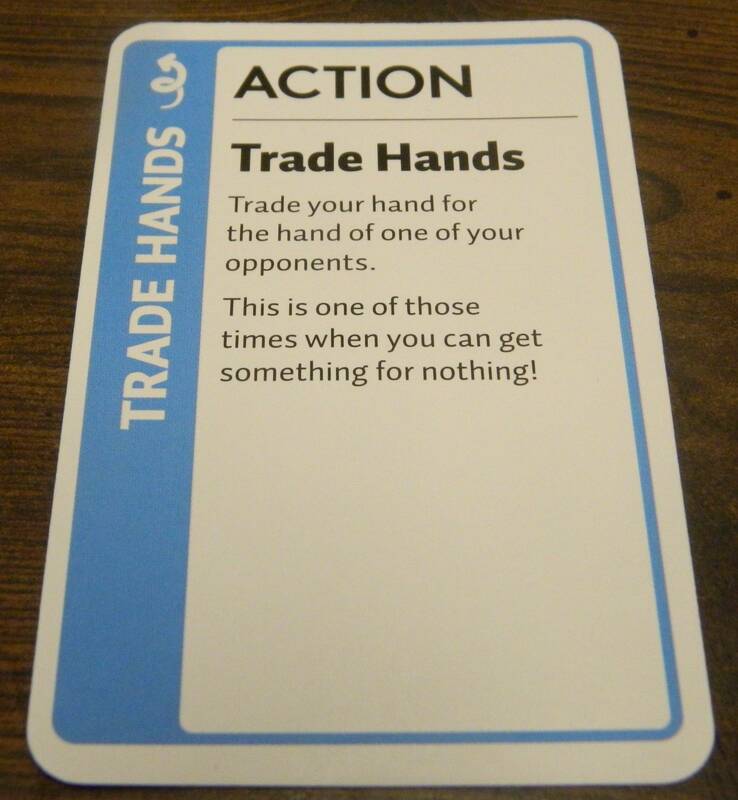 The players will draw five cards, play two cards, and can only have one card left in their hand at the end of their turn. There is also a rule where players get the opportunity to guess the organ pictured on a keeper card before it is played based on its description. New Rule: New rule cards are played in the middle of the table and change the rules of how the game is played. When a new rule contradicts a rule card already in play, the old rule card is discarded. When a player plays a new rule it goes into affect immediately. For example if the card forces players to draw more cards, the current player will draw the additional cards. Goal: Goal cards are played in the middle of the table and apply to all of the players. When a goal card is played, the old goal card is discarded. 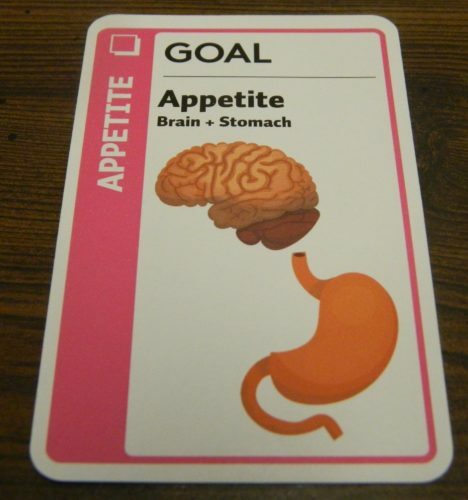 The goal card lists the current objective of the game. In order to win the game a player has to have all of the cards in front of them that match the goal card. Keeper: Keeper cards are played in front of the player who played them. Keepers are used to help a player complete a goal. Players can play as many keepers as they want but will have to discard keepers if they go over the keeper limit. Action: Action cards are played for the action printed on the card. The player performs the action on the card and it is then discarded. Anything that happens due to an action card being played counts as just one card being played. Creeper: Creepers are similar to keepers except that they prevent you from winning. When a player draws a creeper they have to play it in front of themselves immediately and draw a new card to replace it. When played a creeper is attached to one of the keepers played in front of the player. Ungoal: Ungoals are the same as goals except when the conditions on the card are met all of the players immediately lose the game. The game ends as soon as one of the players meet the conditions of the current goal card. The player who completes the goal card wins the game. This player has played the lungs and blood vessels keeper cards so they have won the game. Being a Fluxx game I will start by pointing out that Anatomy Fluxx shares a lot in common with the rest of the series. If you have ever played a Fluxx game before you should already have a good idea of what to expect out of the game. Fluxx is the game of ever changing rules and that doesn’t change in Anatomy Fluxx. The premise of the game is to use your cards to acquire the keepers that are needed to complete the current goal. There is some strategy in figuring out how to best use your cards but Anatomy Fluxx still relies on quite a bit of luck. I have always liked the Fluxx series of card games. If you have never really cared for the Fluxx series, Anatomy Fluxx is not going to change your mind. If you like Fluxx though I don’t see any reason why you wouldn’t also like Anatomy Fluxx. Anatomy Fluxx doesn’t bring any new types of cards to Fluxx franchise. Therefore most of the unique features of Anatomy Fluxx come from the theme and some of the unique rule and action cards exclusive to Anatomy Fluxx. Being part of the educational line of Fluxx games, most of these additions are used to add some educational mechanics to the game. Several of the new rule cards bring a trivia style mechanic to the game. 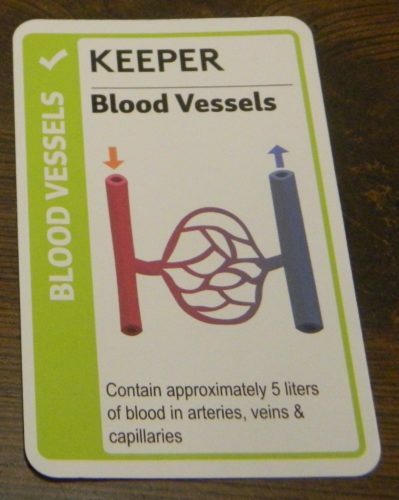 Every keeper card in the game also features a small description of the organ’s purpose. 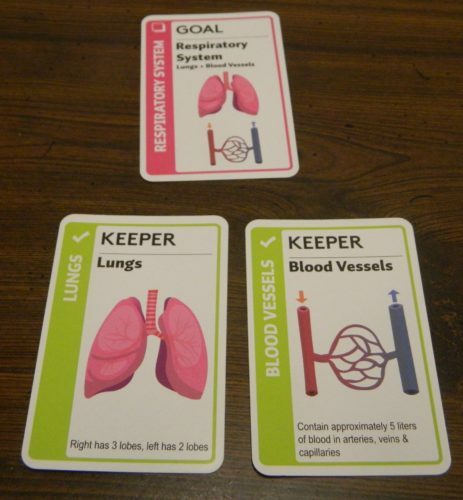 The three most unique rule cards in the game help test the players’ knowledge about the organs included in the game. The first rule card is “Name That Organ”. Whenever a player is going to play a keeper card they first read out the description of the organ to the player on their left. This player has an opportunity to guess the organ based on the description. If they guess correctly they get to immediately draw a card from the draw pile. Next there is “Knowledge Bonus”. Knowledge Bonus works similar to Name That Organ except that the player will read the name of the organ. The player on their left has to try and guess the fact that is on the bottom of the card (the purpose of the organ). If they are correct they get to draw a card. Finally there is “Alternate Factlets” which basically lets players draw a card if they can provide a non-silly factual statement about a keeper on the table that hasn’t already been mentioned. While people that haven’t taken an anatomy/biology class recently might have some trouble earning extra cards, I think these cards work really well at adding an educational aspect to the game. If you use the meta rule where either Knowledge Bonus or Name that Organ have to be in play at all times, I can see Anatomy Fluxx working really well as a way for players to reinforce their knowledge of the organs included in the game. The alternate factlets could also be used as a way to expand the players’ knowledge of the organs included in the game. For this reason I actually see the game working really well in an Anatomy/Biology class or for someone studying the topic. With how random Fluxx can get it has always had a highly variable game length. Despite playing so many games of Fluxx I had never played a game that lasted for more than 15-20 minutes. Most games that I have played have taken 5-15 minutes. One of the games of Anatomy Fluxx that I played was the longest Fluxx game that I have ever played. This game probably took at least 30-45 minutes. It may have just been bad luck but I think Anatomy Fluxx is generally going to take longer than most Fluxx games. I think the biggest reason that Anatomy Fluxx takes longer than most other Fluxx games is that it feels like there aren’t as many cards that you can use to mess with the other players. The easiest way to win a game of Fluxx quickly is to steal another player’s keeper and then change the goal to something that will win you the game. While these cards are still present in Anatomy Fluxx they didn’t seem to come up as often as they usually do. This lead to the game being a little less cutthroat than a typical Fluxx game. In the game that took 30-45 minutes there were more keepers on the table at the same time than I had ever seen in a game of Fluxx. I wouldn’t consider this to be a good or bad thing. It just means that Anatomy Fluxx feels a little less cutthroat than some of the other games in the series. The other reason why I think Anatomy Fluxx takes longer than a lot of other Fluxx games is that it seems to be kind of hard to get rid of creepers. I quickly looked through the deck and I only found around five cards that let a player get rid of a creeper. This makes the game take a little longer since a player can’t win the game if they have a creeper in front of them. The creepers were so hard to get rid of in one game that for a majority of the game all of them were in play at the same time. A couple players could have won the game earlier if they could have gotten rid of their creepers. While on the topic of the creepers I want to quickly talk about the Ungoal cards. 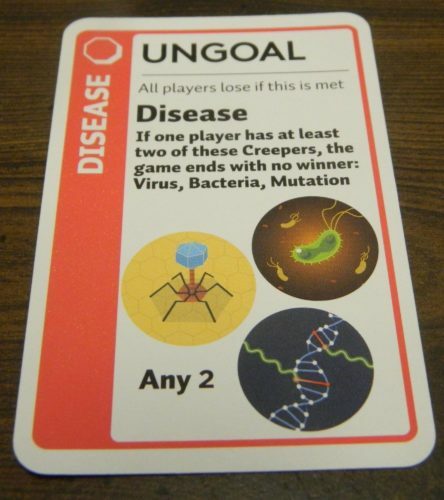 The Ungoal cards are a type of card that has been used from time to time in various Fluxx decks including Cthulhu Fluxx, Martian Fluxx, and Zombie Fluxx. Now the Ungoal cards return in Anatomy Fluxx. Since they are not common in a lot of Fluxx decks I want to quickly talk about them. Basically the Ungoal acts as the opposite of a Goal card where when it is met all of the players lose instead of one player winning. 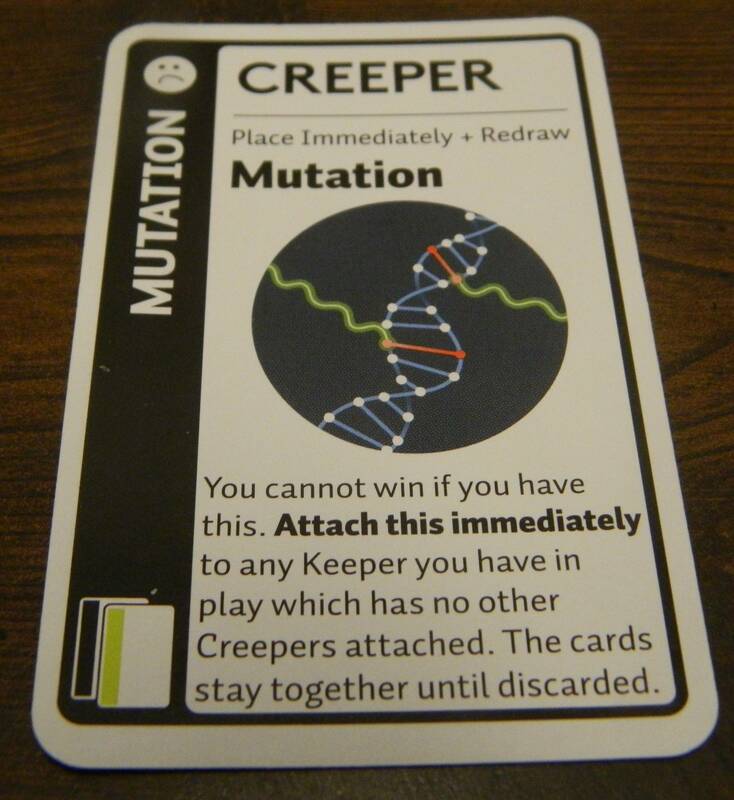 The Ungoal cards in Anatomy Fluxx have to deal with the creeper cards being in play. In one of our games I think we would have met both Ungoals if they would have been in play. What is unique about Ungoal cards in Anatomy Fluxx is that in some versions of Fluxx you have to play them as soon as they are drawn. That is not the case in Anatomy Fluxx as a player can choose whether or not to play them. I think this is an interesting change as I see the Ungoal cards being played in two situations. The cards will be played immediately if they are forced to be played due to another card. I could also see players who don’t think they are going to win play the card so the rest of the players lose with them. Honestly I think the Ungoal cards are a nice addition to the game since they add a little variety and don’t drastically change the game. While there is nothing offensive about Anatomy Fluxx I would like to quickly point out that Anatomy Fluxx may not be for everyone. The reason I say this is that Anatomy Fluxx does contain cards related to the reproductive systems. There is nothing graphic about the cards as they just include drawings of the organs and some information about them. They are basically addressed like they would be in a science class. The reason I bring this up is if you are planning on playing the game with younger children you may want to reconsider or you might have some awkward questions to answer. Before wrapping up I will quickly talk about the components for Anatomy Fluxx. Like the rest of the games in the Fluxx series, the game comes with a hundred cards. The card quality is typical of the Fluxx franchise. The artwork on the cards is pretty nice. Unlike the rest of the series though the artwork is also informational. The keeper cards also include some information about the corresponding organ. Should You Buy Anatomy Fluxx? Basically Anatomy Fluxx is exactly what you would expect it to be, an anatomy/biology themed Fluxx deck. There are no new types of cards in the game. The game differs from other Fluxx decks due to the theme and the educational rule cards that can be played in the game. While these new rule cards don’t drastically change the game I actually think they will work really well in an educational setting. Two of the rules reinforce information about organs and their purpose. 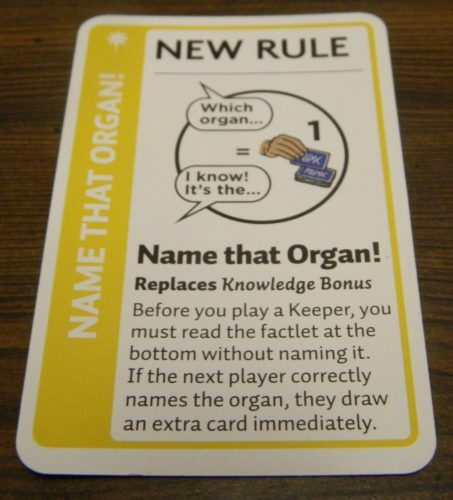 Another rule card encourages players to learn more information about the organs included in the game. Outside of these educational rules there are some unique action cards, Ungoals return, and there are some other new cards that are unique to Anatomy Fluxx. If you have never liked the Fluxx series, Anatomy Fluxx won’t change your mind. If you already own a Fluxx game, whether you should purchase Anatomy Fluxx mostly comes down to how much the theme appeals to you. If you don’t really care about the Anatomy theme it probably isn’t worth picking up. 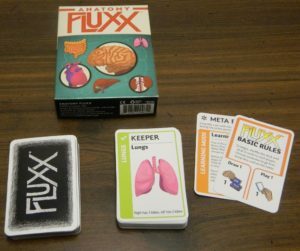 If you are interested in anatomy/biology or are looking for a game that would work well in an educational setting, I think Anatomy Fluxx could work quite well for you. Should work well as an educational game for anatomy. Has some interesting new rule cards. Only has some slight differences from the rest of the Fluxx franchise. If the theme doesn't really appeal to you, there are Fluxx games that will probably be better for you.